Make portion control a breeze with our collection of portion spoons! 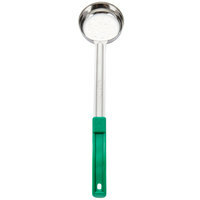 This 4 oz., perforated, green portion spoon is one-piece and can be used to measure food for both wet and dry portion control. It has a color-coded handle for easy identification and kitchen organization! The colored handle eliminates the stress over spending too much time searching for the right spoon. The perfect serving size for many different items! We've already fallen in love and plan to purchase more! The perforations are handy, and the quality of these are amazing. Great product at a wonderful price. Every restaurant owner tells you that the hardest part of a resaurant is keep food cost down. Use these portion spoons to ensure you are not over portioning your dishes! Really Great for serving the exact portion and control your cost, really a great option, and with the perforations its perfect for the food that haves a lot of juice, really great quality item!! A small investment that helps ends meet and keeping our customers satisfied. Elimates over / under portioning so each customer gets the same amount of side. Keeps our presentation standards high as well. These were a really good price and are just the size I needed for portion control on our canned fruit at the salad bar. Easy for kids to get their half cup of fruit! nicely done. this 4 oz perforated portion spoon seems to be very practical to use with soups type foods... i use it for corn ans shaved ice. Handle is perfect for gripping. Great spoon for serving sauce over food. Exact measurement and length is great for deeper pots. Also great for flat pans. As soon as we recieved, we start to control our serving portions, this is an excellent item to you buffete service or your fast food service, the portions spoon is really strong and well manufactured. Nice Product!! We use these 4oz portion spoons for serving beans and they give us a consistent portion to our customers. It is easy to clean and very durable. This 4 oz. spoon really comes in handy when cutting down on food cost and keeps all servings even. Its really heavy duty being stainless steel. I also love the green cool handle. Great for precise measurement of rice portions in some of our complete meals. Easy to clean and very cost effective. Thought getting into the corners of the pan would be hard, but its not. This 4 ounce perforated portion spoon is great for anyone who is wanting to monitor costs on their food line. This features one piece construction and a nice grip on the handle. These are also dishwasher safe for easy cleanup. Since there is a different color for each size spoon, it makes serving a variety of portions very simple. This 4'ounce spoon is a great serving spoon for items that need a little straining or sifting before being served. A comfortable handle and a durable spoon makes this a purchase well worth it. We have this in the 6oz and 2 oz, works great! I would definitely recommend this tool for those who need to separate juices from anything. Great tool to have when you are trying not to run out of food so quickly and easily. Also these help with keeping the liquid from running all over someone other food in their plates. They make everything soooo much better and we love the long handles which keeps people hands at a great distance! I love the color codes on these!! Just used my 4 oz perforated portion spoon for the first time for slippery joes. Was great because allowed for accurate portion control and allowed the oil to drain instead of soaking the bun. Tiny, but great for things like sides if you're trying to measure them out precisely. Bought a lot of them for a friend trying to lose weight and watch how much she eats. The 4 oz. One-Piece Perforated Portion Spoon is a great item to have in the kitchen. The quality exceeded my expectations and the price makes it a great deal. Definitely recommend! Great product. This slotted spoon is a must have for any catering business. The spoon ensures constant portion size and drains the liquid from the serving product. Color coded handle ensures the handle remains cool to touch. Every kitchen needs at least two of these spoons. They last a long time, and they are nice for scooping things with a lot of liquid, like baked beans or cole slaw. They are very cheap for the price, and yet after being used in the kitchen three times a day, for three months, they look brand new, fresh out of the box. Would recommend due to their durability. Perfect for dishing sides. This perforated spoon drains any unwanted juice from vegetables as your are plating. Great easy grip rubber handle that does not heat up. This is perfect when plating many plates at once. Nice rubber handle and stays cool when in a hot pot. Nice flat bottom so it doesn't roll when you put it down. This perforated spoon is of great quality despite its low price. I thought for sure it would be flimsy and not hold up to our rigorous use. It strains perfectly. The 4 oz. One-Piece Perforated Portion Spoon is perfect for doling out sides or for saucing bigger pizzas, etc. These are really nice for the money. The 4 oz. One-Piece Perforated Portion Spoon worked great in getting pinto beans from my 930 pressure canner, which is really big. Easily able to serve loved ones pinto beans without much of the bean liquid. Great spoon. I made this purchase for home used. I really like the long handle and the fact that it can be used with high heat and the handle will not melt. Will be buying more sizes. I own a few of these portion spoons good for tons of stuff. use for hot and cold items. the color handles are a good touch to so you just grab the right one the first time. We use these portion scoops with our steam table to portion out just the right amount of product. These help us cut down on food cost and also to make sure each plate looks the same. We also use these to measure out other products like mayo and mustard for salads. I love this perforated portion spoon. It is great for serving vegetables or anything you would like to strain. They are easy to clean and a great price. In additional to great for portion control, this spoon is very useful to drain what ever I am portioning. I love the quality-a very sturdy spoon! If you buy this product, you will not be disappointed. This product is very durable. We use it all the time for food portion control. We spooned out a lot of side items without knowing how much before we got these. Perfect for baked beans or any liquid side item. The 4 oz perforated spoons are great to use for side items that need to be strained before plating. Great for portion control that customers expect. This four ounce spoodle gives every customer the right amount on their plate. And more importantly it helps you give each customer the same amount.